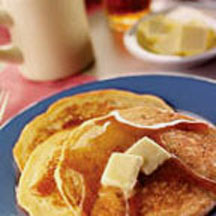 The vanilla yogurt and buttermilk contributes to the tenderness of these pancakes as well as giving them a subtle sourdough-like flavor that goes well with butter and warm maple syrup. In a large bowl, stir together flour, baking powder, baking soda, sugar and salt; set aside. In a small bowl, beat eggs; add yogurt and mix well. Stir in buttermilk and melted butter. Pour liquid ingredients into dry ingredients all at once and whisk just until moistened. Heat griddle and 2 tablespoons butter over medium heat (300ºF / 150ºC for electric griddle). Pour 1/4 cup batter into griddle for each pancake. Cook 2 to 3 minutes until underside is golden, then flip. Cook 3 to 4 minutes more, until center springs back when gently pressed. Use additional butter, if necessary to prepare remaining batter.